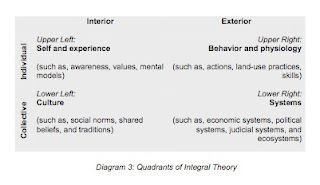 This is a cool article (Gail Hochachka is a major player in the Integral world) from a cool blog, Zero Integral - check it out. However, this does not mean everyone must become an interdisciplinary expert. Nice talk. Dan Ariely is the author of the New York Times Bestseller Predictably Irrational: The Hidden Forces that Shape Our Decisions and of The Upside of Irrationality: The Unexpected Ways We Defy Logic at Work and at Home. Ariely is the James B. Duke Professor of Psychology and Behavioral Economics at Duke University. One of the challenges of human life is what's good for us in the long term often doesn't seem good for us right now. Dieting, for example, is not so much fun now, but good for the future; the same goes for saving money or submitting to preventive medical tests. When we face such tradeoffs, we often focus on the short term rather than our long-terms goals, and in the process we get ourselves into trouble. But wait! There is hope. By understanding where we fall short, there are methods we can use to overcome our natural (and less than desirable) inclinations. Using simple experiments, Dan Ariely studies how people actually act in the marketplace, as opposed to how they should or would perform if they were completely rational. His interests span a wide range of daily behaviors and his experiments are consistently interesting, amusing, and informative, demonstrating profound ideas that fly in the face of common wisdom. What is meant by going for refuge is that you are seeking refuge from some fear. All the objects [Buddha, lama, guru, etc.] in front of you are what is known as the causal refuge, because they serve as the cause for bringing about the resultant refuge within you. You should entrust yourself to these objects from the depth of your heart, and you should see the objects as protectors. The resultant state of your own future realizations, becoming an arya being and attaining buddhahood--which depends on your own actualization of the path--is called the resultant refuge. Someone in difficulty seeking the assistance of a high official is analogous to someone seeking refuge in the causal refuge. But depending upon others' protection forever is not a courageous way of life; therefore, one has to try to achieve a state where one is no longer dependent upon such a refuge, and this is likened to taking refuge in the resultant buddha, dharma, and sangha. That is the process of taking refuge by a person of high faculty and courage. This practice should be done not for the sake of oneself alone but rather for the sake of all other sentient beings. When you cultivate such an aspiration focused toward the achievement of the omniscient state, it is very much like the generation of the bodhichitta mind. Excellent resource for those who are interested in this quickly advancing area of research. Brief review of the current scientific research on the therapeutic effects of psilocybin and psilocin on humans, reported rates of use of psilocybin in the United States, the types of social and legal discrimination and stigma surrounding the illegal possession and use of psilocybin, and providing internet-based resources for clinicians. Provides list of questionnaires and other research tools used to assess psilocybin-induced spiritual and mystical experiences. Many of the methods of practicing Dharma that are learned during waking can, upon development of dream awareness, be applied in the dream condition. In fact, one may develop these practices more easily and speedily within the Dream State if one has the capacity to dream lucidly. There are even some books that say that if a person applies a practice within a dream, the practice is nine times more effective than when it is applied during the waking hours. The dream condition is unreal. When we discover this for ourselves within the dream, the immense power of this realization can eliminate obstacles related to conditioned vision. For this reason, dream practice is very important for liberating us from habits. We need this powerful assistance in particular because the emotional attachments, conditioning, and ego enhancement which compose our normal life have been strengthened over our many, many years. In a real sense, all the visions that we see in our lifetime are like the images of a dream. If we examine them well, the big dream of life and the smaller dreams of one night are not very different. If we truly see the essential nature of both, we will find that there really is no difference between them. If we can finally liberate ourselves from the chains of emotions, attachments, and ego by this realization, we have the possibility of ultimately becoming enlightened. Cool - more proof that mind and consciousness are not confined to the brain. The article makes reference to polyvagal theory, which has been widely documented and accepted in trauma work, but seems to have been largely ignored outside of that field. Turns out that cultivating a lifestyle of gratitude is harder than simply wanting to do it - via Futurity, a news outlet for university research. Psychologist Robert Emmons says his 10 strategies can help anyone cultivate a more grateful approach to life. But he warns that the exercises are not for the "intellectually lethargic." And he stresses that gratitude is incompatible with feelings of victimhood or entitlement, or with the inability to recognize one's shortcomings or to admit one is not self-sufficient. "Far from being a warm, fuzzy sentiment, gratitude is morally and intellectually demanding," he says. "It requires contemplation, reflection and discipline. It can be hard and painful work." “Gratitude is literally one of the few things that can measurably change people’s lives,” Robert Emmons writes in his book Thanks! How the New Science of Gratitude Can Make You Happier. The book outlines 10 strategies for cultivating a feeling of thanksgiving throughout the year. The work is supported by the John Templeton Foundation. Damn. If it worked then, why not do it now? Lehto's book is Chrysler's Turbine Car: The Rise and Fall of Detroit's Coolest Creation. Too bad they filmed this in such a way that we can't see the picture/powerpoint the audience saw. In 1964, Chrysler gave the world a glimpse of the future. They built a fleet of turbine cars--automobiles with jet engines--and loaned them out to members of the public. The fleet logged over a million miles; the exercise was a raging success. These turbine engines would run on any flammable liquid--tequila, heating oil, Chanel #5, diesel, alcohol, kerosene. If the cars had been mass produced, we might have cars today that do not require petroleum-derived fuels. The engine was also much simpler than the piston engine--it contained one-fifth the number of moving parts and required much less maintenance. The cars had no radiators or fan belts and never needed oil changes. Yet Chrysler crushed and burned most of the cars two years later; the jet car's brief glory was over. Where did it all go wrong? Controversy still follows the program, and questions about how and why it was killed have never been satisfactorily answered. Steve Lehto has interviewed all the surviving members of the turbine car program--from the metallurgist who created the exotic metals for the interior of the engine to the test driver who drove it at Chrysler's proving grounds for days on end. Lehto takes these first-hand accounts and weaves them into a great story about the coolest car Detroit ever produced. Good talk by John Perkins - Confessions of an Economic Hit Man and The Secret History of the American Empire: The Truth About Economic Hit Men, Jackals, and How to Change the World - on how the collective crises we face as a species should bring us together to generate change. For the first time in history every human being faces the same crisis, including climate change, diminishing resources, and economic turmoil. Because of the internet and cell phones, we all know that the old approaches have failed. John Perkins spent three decades as an Economic Hit Man, business executive, author, and lecturer. He lived and worked in Africa, Asia, the Middle East, Latin America, and North America. Then he made a decision: he would use these experiences to make the planet a better place for his daughter's generation. Today he teaches about the importance of rising to higher levels of consciousness, to waking up - in both spiritual and physical realms - and is a champion for environmental and social causes. He has lectured at universities on four continents, including Harvard, Wharton, and Princeton. I am sometimes frustrated with the materialist/reductionist aspect of neuroscience research. On the other hand, some of what they are discovering about brain function is both important in understanding how we function as human beings, and it also points to subjective skill-sets we can develop in contemplative experience. In a study from a team including Chrisof Koch, they have found the neuroimaging points to a functional dissociation in the brain: attention as analyzer and consciousness as synthesizer. I am not sure on a first read what the implications of this might be, but I am very intrigued. Recent research has slowly corroded a belief that selective attention and consciousness are so tightly entangled that they cannot be individually examined. In this review, we summarize psychophysical and neurophysiological evidence for a dissociation between top-down attention and consciousness. The evidence includes recent findings that show subjects can attend to perceptually invisible objects. More contentious is the finding that subjects can become conscious of an isolated object, or the gist of the scene in the near absence of top-down attention; we critically re-examine the possibility of ‘complete’ absence of top-down attention. We also cover the recent flurry of studies that utilized independent manipulation of attention and consciousness. These studies have shown paradoxical effects of attention, including examples where top-down attention and consciousness have opposing effects, leading us to strengthen and revise our previous views. Neuroimaging studies with EEG, MEG and fMRI are uncovering the distinct neuronal correlates of selective attention and consciousness in dissociative paradigms. These findings point to a functional dissociation: attention as analyzer and consciousness as synthesizer. Separating the effects of selective visual attention from those of visual consciousness is of paramount importance to untangle the neural substrates of consciousness from those for attention. Provisional PDF of the full article is open access. Here is the introduction to get your interest. Although often used in everyday speech and in the scholarly literature, “selective attention” and “consciousness” lack clear definitions. Partly because of this deficit there exists a lively debate on the relationship between the two. For clarity, we start with stating our usage of the terms “attention” and “consciousness”. We use the term “attention” to imply selective attention, rather than the processes that control the overall level of arousal and alertness. We focus on top-down, goal-directed endogenous attention and not on bottom-up, saliency-driven exogenous attention (Itti & Koch, 2001). We do so because top-down attention and consciousness can be independently manipulated without changing the visual inputs (e.g. van Boxtel, Tsuchiya, & Koch, 2010), while bottom-up attention, almost by definition, needs to be manipulated by changing the physical properties of a cueing stimulus, such as its visual features or its spatio-temporal relationship with a target stimulus. Thus it is difficult to disentangle bottom-up attention from consciousness (but see (Chica, Lasaponara, Lupianez, Doricchi, & Bartolomeo)). By consciousness, we refer to the content of consciousness (sometimes also referred to as awareness), and not to states or levels of consciousness (e.g., wakefulness, dreamless sleep or coma). Furthermore, we restrict this review to visual attention and visual consciousness, as the psychology and the neurophysiology of vision is much better understood than those of other modalities. It is generally acknowledged that attention and perceptual consciousness share an intimate relationship. When an observer pays attention to an object, he or she becomes conscious of its various attributes; when attention shifts away, the object seems to fade from consciousness. Because of this tight relationship some scholars posit that these two processes are inextricably entangled, if not identical (Chun & Wolfe, 2000; De Brigard & Prinz, 2010; Jackendoff, 1996; Mack & Rock, 1998; Merikle & Joordens, 1997; Mole, 2008; O'Regan & Noe, 69 2001; Posner, 1994; Prinz, 2010; Velmans, 1996). Others, however, hold the position that attention and consciousness are distinct phenomena, with distinct functions and neuronal mechanisms that can be dissociated through clever experimentation (Baars, 2005; Bachmann, 2006; Block, 2005; Dehaene, Changeux, Naccache, Sackur, & Sergent, 2006; Hardcastle, 1997; Iwasaki, 1993; Kentridge, Heywood, & Weiskrantz, 2004; Koch, 2004; Koch & Tsuchiya, 2007; Lamme, 2003; Naccache, Blandin, & Dehaene, 2002; Tsuchiya & Koch, 2008a, 2008b; Woodman & Luck, 2003; Wundt, 1874). Recently, there has been a growing interest in the relationship between attention and consciousness. Many studies have shown a dissociation between attention and consciousness using psychophysics and neurophysiological measurements such as EEG, MEG and fMRI. This review gives an update of our previous overviews (Koch & Tsuchiya, 2007; Tsuchiya & Koch, 2008a, 2008b). In the first half, we closely examine the question of the necessity and sufficiency of attention for conscious perception. In the second half, we review experiments published after our previous reviews. These studies contrast the effects of attention and consciousness for a given percept by independently manipulating the two. Some studies successfully dissociate attention and consciousness, while some even show opposing effects of attention and consciousness. As consciousness is notoriously difficult to define, we here use an operational definition. We will equate consciousness for an object or event, say a stationary grating, with stimulus visibility. As long as the subject can see the grating, he or she is conscious of the grating or of one or more of its attributes (location, orientation, contrast). Other operational definitions involve subjective confidence or wagering procedures (e.g., Persaud, McLeod, & Cowey, 2007; Wilimzig, Tsuchiya, Fahle, Einhauser, & Koch, 2008). Some days, people can really be annoying. Seriously, what the hell is wrong with portraits of gay people? One of the images (follow the link to see them) was removed because it "offends religion"? Silliness at best, censorship in reality. Catholic League President Bill Donohue quite often acts like a tool. The Smithsonian Institution is under fire for an exhibition called Hide/Seek that is being touted as the "first major exhibition to focus on sexual difference in the making of modern American portraiture." Martin Sullivan, director of the Smithsonian's National Portrait Gallery, says the artist created the piece as a response to the "agony and suffering" of his partner who at the time was dying of AIDS. Using "vivid colors, and some fairly grotesque scenes, it's more a meditation on the fragility of the human flesh," Sullivan says. If it's wrong for the government to take the taxpayers' money to promote religion, why is it OK to take taxpayers' money to assault religion? But included in that meditation is a crucifix — a cross bearing the body of Christ — crawling with ants. The image, according to Catholic League President Bill Donohue, is offensive. He calls the video "hate speech" and says that "the Smithsonian would never have their little ants crawling all over an image of Muhammad." Donohue says he complained to members of Congress and the Smithsonian's Board of Regents. "My principle is very simple," he says, "If it's wrong for the government to take the taxpayers' money to promote religion, why is it OK to take taxpayers' money to assault religion?" Donohue admits he has not seen the exhibition Hide/Seek, but he did see the video images of the ants on the crucifix online. Donohue's concerns echo those of others who've complained to the National Portrait Gallery, says Sullivan. So Sullivan decided to remove A Fire In My Belly from the show. "The concern that people of the Christian faith were apparently telling us — 'You wouldn't do this to a Muslim image' — was distracting to the larger and more important themes of the show, which is why we did the exhibition in the first place," Sullivan explains. For the first time a major museum exhibition focuses on gay and lesbian portraiture. At least one critic has accused the Smithsonian of caving in to pressure from Catholics and from two Republican members of Congress. Representative Eric Cantor of Virginia called the exhibition "an outrageous use of taxpayer money." A spokesperson for incoming House Speaker John Boehner told The Hill newspaper that "Smithsonian officials should either acknowledge the mistake or be prepared to face tough scrutiny beginning in January." Political football? You bet, says Lee Rosenbaum, who writes about the arts for The Wall Street Journal. In her blog, CultureGrrl, she says a show like this could be too controversial for a federal institution. "Most of its artists are down the middle of the fairway: big-name American artists like Eakins, Bellows, Hartley, O'Keeffe even," says Rosenbaum. "The problem is that it's such an easy target when they're looking for cuts, when they're looking for differences with the administration, to look at a federal institution — which the National Portrait Gallery is — and try to make that into a big issue." A spokesperson for the Smithsonian says that since the show opened on Oct. 30, the National Portrait Gallery has received only one complaint from a visitor. Sullivan says the rest of the exhibition will remain open until mid-February. TED Talks - William Ury: The walk from "no" to "yes"
William L. Ury co-founded Harvard's Program on Negotiation and is currently a Senior Fellow of the Harvard Negotiation Project. He is the author of The Power of a Positive No: How to Say No & Still Get to Yes, and co-author (with Roger Fisher) of Getting to Yes: Negotiating Agreement Without Giving In, translated into 30+ languages. He is also author of the award-winning Getting Past No: Negotiating with Difficult People and Getting To Peace (released in paperback under the title The Third Side). Over the last 30 years, Ury has served as a negotiation adviser and mediator in conflicts ranging from corporate mergers to wildcat strikes in a Kentucky coal mine to ethnic wars in the Middle East, the Balkans, and the former Soviet Union. With former president Jimmy Carter, he co- founded the International Negotiation Network, a non-governmental body seeking to end civil wars around the world. During the 1980s, he helped the US and Soviet governments create nuclear crisis centers designed to avert an accidental nuclear war. In that capacity, he served as a consultant to the Crisis Management Center at the White House. More recently, Ury has served as a third party in helping to end a civil war in Aceh, Indonesia, and helping to prevent one in Venezuela. Ury has taught negotiation to tens of thousands of corporate executives, labor leaders, diplomats and military officers around the world. He helps organizations try to reach mutually profitable agreements with customers, suppliers, unions, and joint-venture partners. Score one for the social constructionist models of human minds, consciousness, and identity. It appears from this study that one's culture shapes the composition of one's brain, which will obviously shape the unique perception of self and awareness. Did you know that our brain function is entirely different when we think about our own honesty versus when we think about another’s honesty? That’s if the “we” is American. For Chinese people their brains look identical when considering either. These sorts of studies fall into so-called cultural neuroscience: the study of how our environment shapes our brain function. Following up on the cultural differences between Asians and Americans, one study published in Neuroimage found that when faced with the same image, people’s neural responses are totally different. Scientists found that when American subjects viewed a silhouette in a dominant posture (standing up, arms crossed) their brain’s reward circuitry sparked. Not so for Japanese subjects. For the Japanese, their reward circuitry fired when they saw a submissive silhouette (head down, arms at sides). This physiological response matches a well-known behavioral difference: Americans favor and encourage dominant behavior. Japanese culture reinforces submissive culture. This study, and many others, is referenced in a recent article in the American Psychological Association’s Monitor. One might think, well, these studies add nothing revolutionary and are simply revealing the wiring behind already well-known behavior. Then again isn’t it a good thing for science to understand the wiring behind a light bulb instead of just observing that it goes on when someone walks into a room? Geeky science philosophizing - on Decoherence - from Stuart Kauffman at NPR's 13.7: Cosmos and Culture blog. The current best accepted approach to the emergence of the classical world from the quantum world requires a fundamental shift from considering closed quantum systems that cannot lose phase information to open quantum systems in a quantum environment that can lose phase information to the environment. This loss of phase information is known as DECOHERENCE. To gain an intuitive understanding of decoherence, return to the water waves passing through the two gaps in the sea wall and propagating toward the beach. Imagine that a “decoherence” process was able to “lose” information about where the peaks and troughs of the propagating waves were to regions outside the local system. As this occurred, the “decoherent” waves, upon hitting the beach, would not “know” where peaks and peaks summed to higher peaks and peaks and troughs cancelled. Decoherence is well established experimentally and hinders quantum computation. I will now describe some of what is or appears to be known about decoherence. Decoherence takes an interval of time. A femtosecond, 10 to the - 15 seconds, is a typical time scale. Decoherence is a dissipative process, phase information is LOST from the open quantum system to the environment, thus during decohrence, the Schrodinger equation cannot propagate unitarily. Since decoherences takes an interval of time, where a femotsecond is very long on the Planck time scale of 10 to the - 43 seconds, and the unitary Schrodinger equation does not hold, we can expect new physics in the open quantum system in its environment. One example of such new physics is seen in the Quantum Anti Zeno Effect, established experimentally with supercooled sodium ions. The essential result is that decay from one to another quantum state is here FASTER THAN EXPONENTIAL. Recall that familiar radioactive decay is a Markovian process and also a Poisson process, giving rise to the familiar exponential decay of a set of radioactive nuclei and the familiar half life of radioactive decay. The critical result of the Quantum AntiZeno Effect is that the behavior is no longer Markovian or Poisson. It is new physics. Seth Lloyd, a quantum physicist from MIT, informs me that during decoherence superpositions of solutions of the Schrodinger equation DECOHERE VERY RAPIDLY, LEAVING PURE STATES PROPAGATING. This loss of propagating superpositions of the Schrodinger equation in a closed quantum system is new physics. Schrodinger’s cat is no longer a superposition of both dead and alive. Other physicists agree with Lloyd. What is left propagating are “pure states”, not superpositions. This is new physics compared to closed quantum systems where superpositions propagate too. Decoherence can have effects on chemical reactions, speeding or slowing them. This too is new physics. The study of decoherence in chemistry is just beginning with early work on coherent electron transfer in proteins in the presence of decoherence. Decoherence broadens absorption and emission bands in the spectra of chemicals. Decoherence may well alter the behavior of molecules, for example, if some or all heavy nuclei decohere FAPP, altering rotational and vibrational bond behaviors. While decoherence is well established, there are also several lines of evidence that open quantum systems that are partially decoherent or classical FAPP can partially or fully RECOHERE, in the limit to fully coherent quantum behavior. If recoherence can occur, passage from quantum to classical FAPP is reversible! Several theoretical papers by Paz and colleagues and Briegel show how a quantum entangled system can decohere to classicity and, in “Sudden Death and Revival”, return to fully quantum coherent behavior. This has now been demonstrated experimentally, Science News, November 20, 2010. In a fundamental theorem by Shor (84) concerning quantum computer error correction, Shor shows that it is possible to measure some entangled quibits, detect that some qubits are decohering, INJECT INFORMATION into the now OPEN quantum system, and correct the decohering qubits to fill coherece. This theorem has spawned efforts at devising quantum error correction processes. The behavior of chlorophyll wrapped by its antenna protein MAY be the first experimental indication of recoherence. The expected time scale of decoherence for chlorophyll is on the order of a femtosecond. When measured about a year ago, the stunning results for this system at 77K was that chlorophyll remained coherent for at least 7000 femtoseconds. This is creating a large new effort in quantum biology. Similar effects have been found with other light harvesting biological molecules wrapped by their analogues of the antenna protein. Mutations to the proteins tend to destroy the long lived coherence, suggesting strongly that natural selection has acted on the antenna proteins. Now we confront two possibilities. Either the antenna protein, laden with chromophores which absorb and emit photons, PREVENTS DECOHERENCE of chlorophyll, or THE ANTENNA PROTEIN PROMOTES RECOHERENCE. My own guess is the latter, for it is hard to imagine how the antenna protein could entirely prevent decoherence of chlorophyll. One wants to guess that the photons emitted and absorbed by the chromophores are injecting information, Shor Theorem-like, into the chlorophyll molecule and inducing recoherence. Perhaps this is achieved by the light emitted by the chromophores and absorbed by the chlorophyll molecule being in the center of the broadened absorption and emission bands of chlorophyll. Clearly this is open to experimental test. I broach in the next blog post the Poised Realm which may mediate between Res Potentia and Res Extensia. This is a great article from YES! Magazine on the psychological, physical, and emotional benefits of touch. We know that infants can wither and even die without touch (failure to thrive), but that need does not end as we grow up. Touch, compassionate touch, is necessary for human health - both physical and emotional. We are interpersonal beings, and part of that communal need involves loving physical contact. Touch generates oxytocin, the "cuddle hormone," that relieves stress and calms the mind. Next time you feel stressed, lonely, angry, or sad, cuddle up with someone you love and just be together. If that is not available, get a pet - petting our animals also releases oxytocin. that would be good for our health, happiness, and wallets. We Are Hard-Wired to Care and Connect: Recent research has shown that our brains are made to support caring, cooperation, and service. Video: Becoming an Empathic Civilization: Economist Jeremy Rifkin believes we can do it, and now he’s got cartoons to show why. Want the Good Life? Your Neighbors Need It, Too: An interview with epidemiologist Richard Wilkinson, whose research shows that what the healthiest and happiest societies have in common is not that they have more, but that what they have is more equitably shared.